“All Aboard!” this is the Polar Express event theme backdrop like no other. Steaming into the quiet snow covered suburban street the rumbling sounds of the Polar Express steam train bursts onto the scene. The crisp white steam from the smoke stack puffs away as a smiling hand made snowman smiles into the distance. Sleeping families on this magic Christmas night are asleep inside their snow covered houses as the soft snow covers the bare trees. 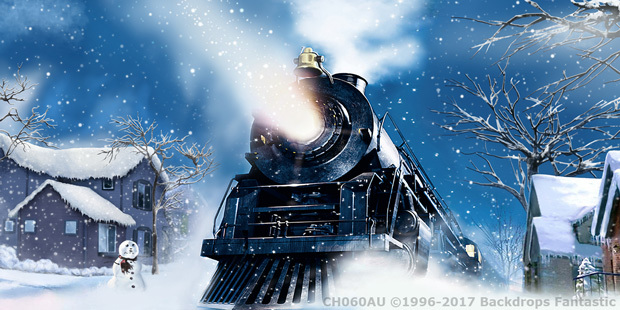 It’s time to Believe and join the Polar Express for a night of magic and Christmas fun! The perfect enhancement to the full size Polar Express Backdrop is our full size 6m x 12m Polar Express Backdrop and our Inflatable Snowflakes.